= Frailea uhligiana Backeb. in Backeb. Descr. Cact. Nov. iii. 6 (1963) Backeb. Habitat: Fraileas are specialized plant that live restricted in a narrow ecological niche among large rock domes protruding from surrounding ground in the zone where the soil meets the rock and is less than 2-3 cm deep. The soil is fine sandy-loamy or fine grained and permeable, but too shallow for a lot of plants that otherwise would shade out the tiny frailea. Frailea uhligiana forms dense colonies in all sizes and grows together with Gymnocalycium chiquitanum and Gymnocalycium damsii v. torulosum. Frailea uhligiana Backeb. in Backeb. Succulenta (Netherlands) 74: 130 1995. 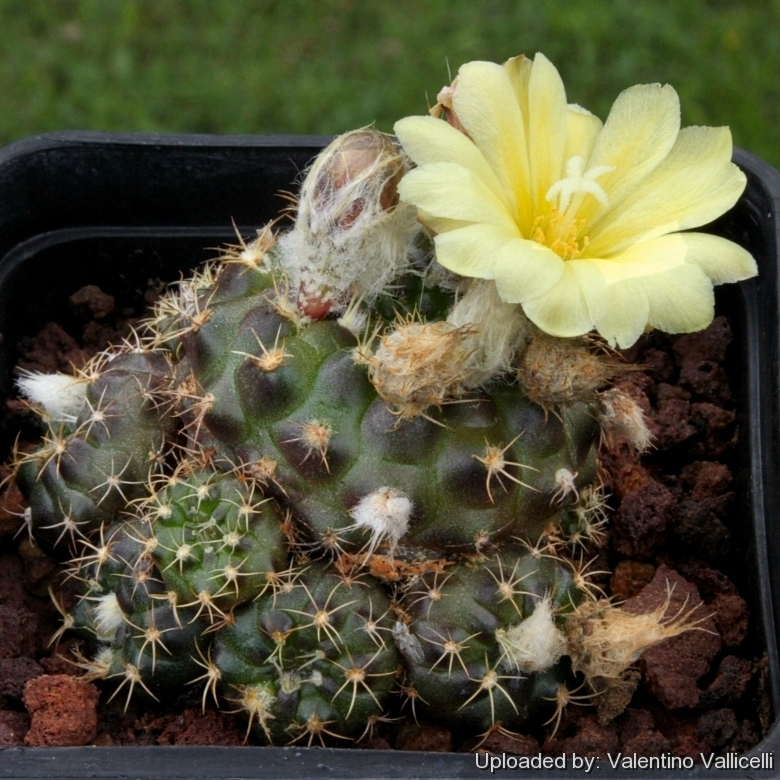 Description: Frailea uhligiana is a dwarf cactus with unique and remarkably beautiful shape. It is one of the geographical forms of the morphologically variable Frailea cataphracta subsp. duchii and it is distinguished for the green to bronze bodies with up to 25 ribs and less adpressed spines up to 4 mm long. The genus is cleistogamous, the colour of the flower is yellow. Habit: It is a s small depressed perennial stem succulent with age begins to clump around the base and grow oddly. It grows deep seated flat to the ground surface. Only in cultivation plants may have a spherical till columnar shape. 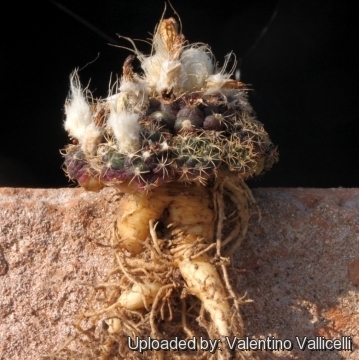 Roots: The rootstock is fleshy, turnip-like, with fine diffuse roots. Ribs: Up to 25, with noticeable tubercles only in the new growth, later flatted above and with a purple-brown lunate, blots situated below the areoles. Areoles: Rounded almost bare or with whitish or brownish wool. Central spines: Absent (occasionally 1 or 2). Flowers: Apical, diurnal, radial, sulphur yellow from the top of the plant, about 3 cm in diameter. Buds with light brown wool. But don't be disappointed when the easily produced buds fail to open. Fraileas are cleistogamous meaning that their flowers produce seed without even opening. Without the need for pollination, hence the buds rarely reach full bloom and remain closed. They will open only in great heat in the hottest, brightest, afternoon sun, if at all. Fruits: Dry indehiscent with scales and bristles that detach easily, pericarp membranous, fragile that break easily releasing the seed. Seeds: Comparatively large, blackish and shining, up to 2 mm wide, circular, hat shaped with a prominent edge. 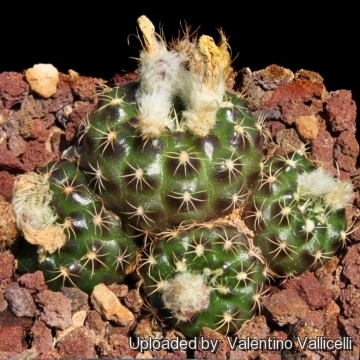 Frailea cataphracta (Dams) Britton & Rose: (subsp. cataphracta), has dull green bodies with few (8-15) ribs, spine to 2 mm addpressed, centrals absent. Distribution: Bolivia and Paraguay. Frailea cataphracta subs. duchii (G.Moser) P.J.Braun & Esteves: has dirty bronze bodies with less than 18 ribs, spines to 4 mm, centrals absent or 1-2. Distribution: southeast of Asuncion, Paraguay. Frailea cataphracta subs. tuyensis (Buining & G.Moser) P.J.Braun & Esteves: has less than 20 ribs. Distribution: Paraguay. Frailea cataphractoides Backeb. : (F. cataphracta subs. duchii) has greyish-olive-green bodies (purplish to black in full sun) with very closely set brown areoles and spines up to 4 mm long. Distributiin: Bolivia. Frailea uhligiana Backeb. in Backeb. : (F. cataphracta subs. duchii) has green to bronze bodies with up to 25 ribs and less adpressed spines up to 4 mm long. Distribution: San Jose between Santa Cruz and Corumba, Bolivia. Cultivation and Propagation: Frailea cataphracta subs. uhligiana is a summer grower species relatively easy to grow. It is sometime seen as a grafted plant but grows very well on its own roots too. Characteristically, during the dry season plants retract completely under the ground both in the wild and in cultivation too. Growth rate: Fraileas are relatively short-lived plants, only lasting few years (rarely more than 10-15 years in cultivation) and, possible annuals in habitat! In fact they reseed readily around the base of the mother plant from self-set seed if kept reasonably moist during warm weather. It is a good idea to keep restarting them from seed; what looks like a healthy big plant may suddenly die of old age without warning.